By Miriam Valverde on Monday, April 1st, 2019 at 10:47 a.m.
Getting an accurate count of the U.S. population is a massive undertaking each decade. The 2020 Census is all the more complicated because of a national controversy tied to a single question that’s been elevated to the U.S. Supreme Court. The Trump administration wants to know how many members of U.S. households are U.S. citizens. But its effort to ask about citizenship has attracted lawsuits from states and immigrant rights groups and challenges from Democratic lawmakers on Capitol Hill. Democrats fear that including a citizenship question will result in undercounts. Republicans and the Trump administration say the question will give detailed information on the citizenship of the voting age population and help the Justice Department better enforce the Voting Rights Act, which prohibits discriminatory voting practices. At a March 14 oversight hearing, Rep. Alexandria Ocasio-Cortez, D-N.Y., questioned Commerce Secretary Wilbur Ross about the motivation and process for including a citizenship question in the 2020 Census. She claimed that the administration violated the law by not providing Congress with all required reports related to the upcoming survey. "While there's all of this debate about whether a citizenship question should be included or not included, the question I have is why are we violating the law to include any question whatsoever in the 2020 census?" Ocasio-Cortez asked Ross, whose agency oversees the Census Bureau. "I've been told by counsel that we have complied with all the regulations," Ross said. Here’s an overview of why a citizenship question in the census is a controversial issue, how the proposed question for 2020 compares to the one in the census of 1950 (the last time all American households were posed a citizenship question), and the extent of the information provided by the Trump administration. Why is including a citizenship question a contentious issue? The census, required by the Constitution, has high stakes: Population numbers are used to determine how many U.S. representatives a state receives. The more people in a state, the more representation in Congress. (Each state has at least one representative; the total is capped at 435.) Census data is also used to draw congressional and state legislative districts and for the distribution of federal funds. In 2020, the Trump administration plans to ask if each person counted is a U.S. citizen. Opponents of the question argue that immigrant communities, particularly households with people in the country illegally, will be less inclined to participate in the census if they have to identify family members who are not U.S. citizens. The census won’t ask if non-U.S. citizens are in the country illegally. But other questions on the form ask for the names of the people who live at the property. In 1980, the Census Bureau’s official position was that questions about citizenship were particularly sensitive in minority communities and could discourage participation. The 1950 Census was the last one to ask all U.S. households whether its dwellers were U.S. citizens. Back then, a census-taker, or enumerator, knocked on doors to interview people and fill out the census form. They asked in what state or foreign country a person was born. If a person was foreign-born, they asked if the person was naturalized. The enumerator marked on the form yes, no, or AP (for born abroad of American parents). For the 2020 Census, the bureau plans to rely more heavily on technology. 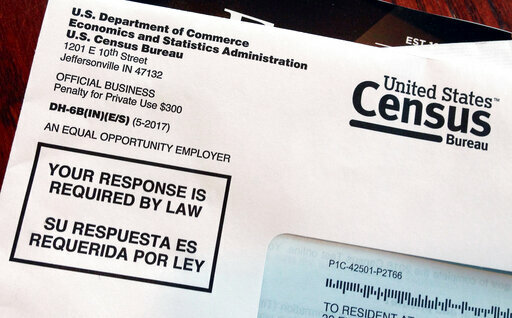 Most people will be asked to respond to the census online, by phone or mail. Enumerators will visit households that don’t respond. • Yes, born in the United States. • Yes, born in Puerto Rico, Guam, the U.S. Virgin Islands, or Northern Marianas. • Yes, born abroad of U.S. citizen parent or parents. • Yes, U.S. citizen by naturalization (add year). • No, not a U.S. citizen. Some households have already seen this question. It appears on the American Community Survey that’s been sent every year since 2005 to about 3.5 million households. From 1970 to 2000, a citizenship question was included only in long-form questionnaires sent to a small sample of households. Ocasio-Cortez at the hearing said the proposed 2020 citizenship question was not a reinstatement of the 1950 question. It’s "quite materially different," she said. Is it? That depends on the meaning of "materially different," said Jennifer Van Hook, Roy C. Buck professor of sociology and demography at Penn State University. "The wording of the question and mode of interview are different, but both questions get at similar information," Van Hook said. The political context has also changed. In 1950, some groups might have felt vulnerable to government targeting and deportation, Van Hook said, but there were very few immigrants living in the country illegally. Most estimates say there are now about 11 million immigrants in the United States illegally. Focus group studies indicate there’s fear among some immigrants that the census information will be turned over to immigration authorities and be used to deport them or people they know, Van Hook said. The Census Bureau says that the "72-Year Rule" legally restricts it from turning over personally identifiable data to any other person or government agency (including immigration authorities) until 72 years after its collection. After that time, census records are released to the public by the National Archives and Records Administration. The bureau also changed its data-collection method in the last few decades to allow households to fill out the forms themselves and mail them back to the government. To encourage participation, the bureau has reduced the number of questions on census forms. What reports has the Trump administration submitted to Congress? At the oversight hearing, Ocasio-Cortez said the administration was required to give Congress three reports on the proposed changes for the 2020 census. The administration failed to provide one of the reports listed under 13 U.S. Code Section 141 (f), she said. The law says that the Commerce secretary has to give Congress a report on the proposed subjects; a report on the proposed questions; and another report after the submission of the subjects or questions report "if the Secretary finds new circumstances exist which necessitate that the subjects, types of information, or questions contained in reports so submitted be modified." The subjects report submitted to Congress in March 2017 didn’t list citizenship as one of the subjects. The questions report submitted a year later included the citizenship question. But Congress didn’t get a third report, Ocasio-Cortez said. In a brief to the Supreme Court, the Trump administration argued that a third report isn’t required. The law doesn’t prevent the Commerce secretary from submitting two reports in one document, and that’s what he did with the March 2018 report, the administration said. President Donald Trump on April 1 tweeted that the Census without a citizenship question would be "meaningless." "Can you believe that the Radical Left Democrats want to do our new and very important Census Report without the all important Citizenship Question. Report would be meaningless and a waste of the $Billions (ridiculous) that it costs to put together!" Trump tweeted. The Supreme Court is expected to rule on the case by the end of June.